Take a deep breath and hold it. You are now engaging in a surprisingly mysterious activity. On average, we humans breathe automatically about 12 times per minute, and this respiratory cycle, along with the beating of our heart, is one of our two vital biological rhythms. The brain adjusts the cadence of breathing to our body’s needs without our conscious effort. Nevertheless, all of us also have the voluntary ability to deliberately hold our breath for short periods. This skill is advantageous when preventing water or dust from entering our lungs, when stabilizing our chests before muscular exertion and when extending how long we can speak without pause. We hold our breath so naturally and casually that it may come as a surprise to learn that fundamental understanding of this ability still eludes science. 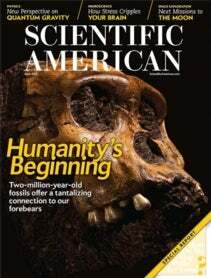 First of Our Kind: Could Australopithecus sediba Be Our Long Lost Ancestor?